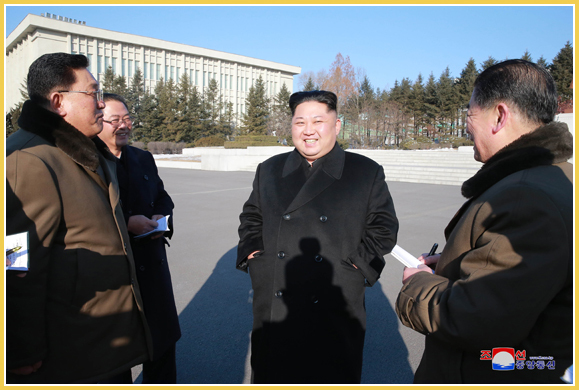 Kim Jong Un, Chairman of the Workers' Party of Korea, Chairman of the State Affairs Commission of the DPRK and Supreme Commander of the Korean People's Army, gave field guidance to the State Academy of Sciences. 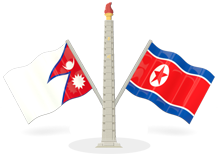 He, together with accompanying officials, made a deep bow to the statues of President Kim Il Sung and Chairman Kim Jong Il in the State Academy of Sciences. He looked round the renovated revolutionary museum of the academy. Carefully looking at the precious historical materials and remains, he said that the academy, founded in December 1952 on the initiative of the President, could follow the proud course of development under the care of the great leaders. He went round the science exhibition hall. The exhibition hall has newly been built well and large numbers of scientific achievements and exhibits are on display, he said. Noting that the brainchild of our scientists is quite amazing, he appraised that the academy is the treasure house and native home of self-reliance and self-development. Highly appreciating that our scientists are doing a great thing in the drive to develop the national economy and improve the people’s living standards even though everything is in short supply, he extended his warms greetings to all scientists and technicians across the country and took a benevolent measure of giving a special bonus to the academy. He stressed that the shortcut to making a breakthrough in implementing the five-year strategy for national economic development, enhancing the independence and Juche character of the national economy and improving the people’s standard of living as required by the revolutionary counterstrategy put forward by the Second Plenary Meeting of the Seventh Central Committee of the Party is to give precedence to science and technology. Expressing his expectation and belief that the officials and scientists of the academy would always bear in mind the intention of the Party that put forward the front of science as the outpost for defending socialism and make a tangible contribution to building a prosperous and powerful country with a high ideal and dream by making eye-opening scientific achievements, he had a photo session with them.